Saline lakes occur throughout the word and have significant economic, ecological, biodiversity and cultural value (Williams, 2002). Inland saline lakes are found throughout the arid (25-200 mm annual precipitation) and semi-arid (200-500 mm) basins of the word (Jellison et al., 2004). They include a vast array of lakes of different size, salinity, ionic composition and different biotic (flora and fauna) assemblages (Hammer 1986, Williams 1996). The global volume of inland saline water (85 000 km3) is only slightly less than that of freshwater (105 000 km3) (Shiklomanov, 1990). They are often key-stone habitats in the landscape providing places for endemic species and hosting many breeding and migratory birds (Jellison et al., 2004). Temporary, is a general term for all water bodies (standing or flowing waters) which alternate between phases of inundation and drought. The part of the lake which is flooded by water is strongly influenced by the balance between hydrological inputs (precipitation, surface runoff and groundwater inflows) and outputs (evaporation and seepage losses)- changes due to seasonal and climatic variation or anthropogenic activities (Boulton & Brock, 1999). The water quality of temporary salt lakes is generally less constant than in permanent water bodies (Smith et al., 2004; Boulton & Brock, 1999). During the filling phase, salinity may be low but as the drying starts, salinity increases, reaching the peak when the hydrological cycle is completed. The highest concentration of water nutrients in the temporary standing water bodies occurs during the first fill of the lake or while it is drying-out (Boulton & Brock, 1999). 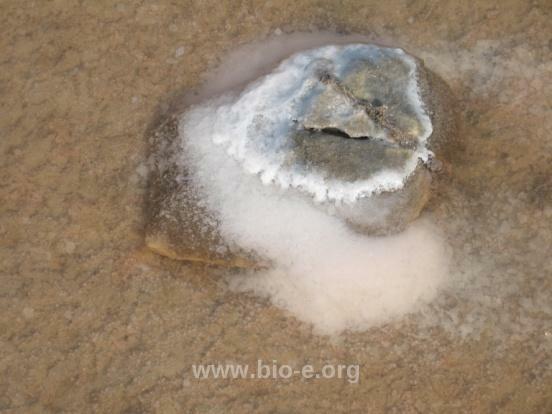 Also, during the filling period, nutrients, biota, biotic propagules, organic debris and particulates may be washed into the lake bed initiating biodegradation of organic material as well as release of nutrients; this triggers a chain of biological processes. Furthermore, the littoral vegetation (salt-tolerant halophytic) and cryptogamic “crusts” are important in maintaining the integrity of the lake system (Campagna & John 2003). During the vegetative period the temporary salt lakes become an area of high productivity and species-richness as releases of nutrients and hatching of spores and cysts are initiated (Chaplin & John, 1999). The cyclical nature of the temporary waters creates habitats that are quite distinct from those found in permanent waters (Williams, 2005). Temporary wetlands are not “waste lands”; they are natural elements of arid and semi-arid landscapes and represent distinct habitats for many species, some of which are not found elsewhere. They support many taxa that either are not found in other habitat types, or have their highest population in temporary waters (Williams, 2002). In terms of contributing to the Cyprus’s overall aquatic biodiversity, saline temporary waters are of considerable importance. Cyprus is an island that traditionally had experiences frequent periods of drought and a seasonally semi-arid climate. The low level of annual rainfall (400-600mm), the high evaporation and the disruption of the hydrological regime result in wide water level fluctuations. Wetlands with temporary water conditions exist along the coast and in lowlands, but their numbers are limited and many have been lost after human-induced habitat and hydrological changes. Larnaca Salt Lake Complex is one of the most important natural standing water bodies in Cyprus and is of international ecological significance (declared as a protected area by a decision of Council of Ministers (1997), Ramsar Site, Natura 2000 Site, Special Protected Area under Barcelona Convention, Important Bird Area). It consists of four main lake water bodies, the main Salt Lake (Alyki), Orphani, Soros and the small so-called Airport Lake, which was part of the Orphani Lake but was cut off when the airport runway was constructed. Also, smaller lakes form near the coast to the east of Orphani (Hadjichristophorou, 2008). This wetland area in southeastern Cyprus is in one of the driest parts of the island. The three most important climatic factors determining the development of salt lakes are temperature, net evaporation and precipitation (Williams, 2002). Despite the ecological, economic and aesthetic values of the salt lake ecosystems, the data from Cyprus regarding their ecological functions is very sparse (Tziortzis, 2008; Christia et al., 2011; Manolaki et al., in press). 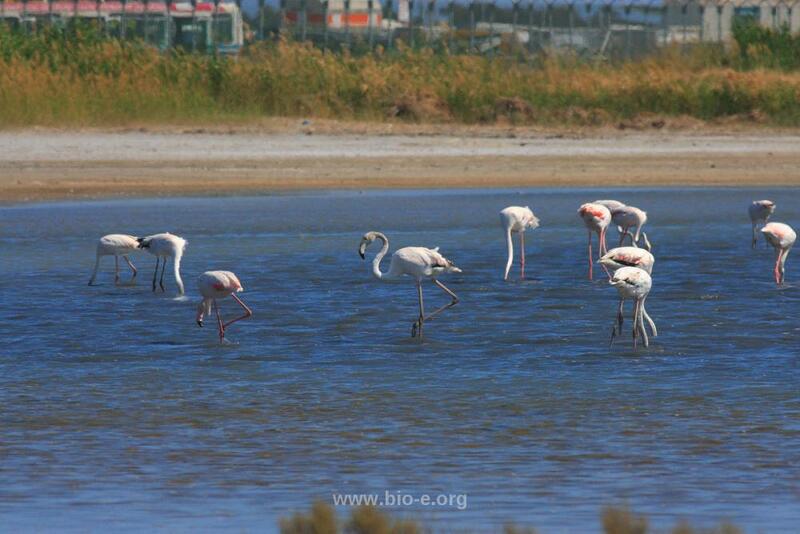 Larnaca salt lake ecosystem includes the aquatic communities of flora and fauna and the extensive halophytic communities on the shores of the lakes. The lakes were connected to the sea until recent times. The Late Bronze Age anchors found in the main Salt Lake and collections of sea shells found in ancient tombs near the Lakes famous medieval mosque, testify that these shells could only have originated in coastal lagoons which were connected to the sea. In fact the salt lake complex is actually a distinctive coastal lagoon habitat. Alyki, the main Salt Lake, has a very high salinity regime, hence its use in the past for salt collection (Hadjichristophorou, 2008). So, to be typologically-correct, this wetland system is actually a distinctive coastal lagoon system that has many characteristics of semi-arid temporary salt lakes. The hypersilinity of Larnaka’s salt lake is inhospitable to many life forms and only the specialized adapted forms can survive. The halophytic organisms can function in environments with high salt concentration because they accumulate substances within their cells which counterbalance the osmotic stress (Wharton, 2002). 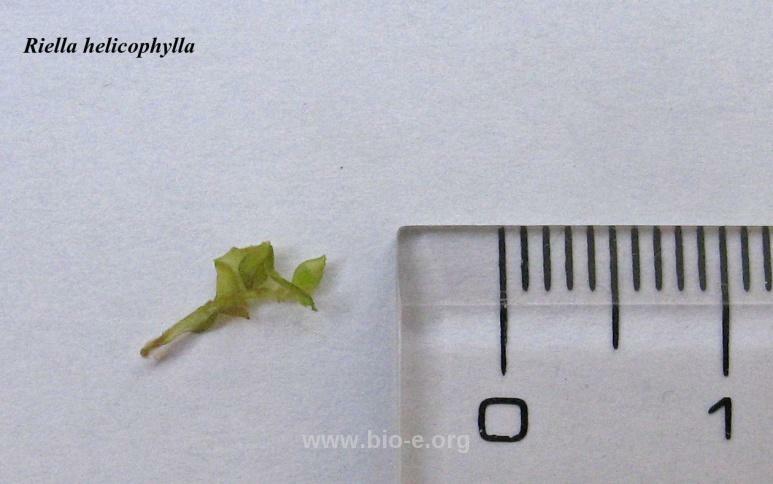 The algae Dunaniella accumulate glycerol which is an osmotic active substance and it takes up space in a solution. The glycerol is also used by the lake’s tiny brine shrimps, the Artemia salina, as well (Wharton, 2002). 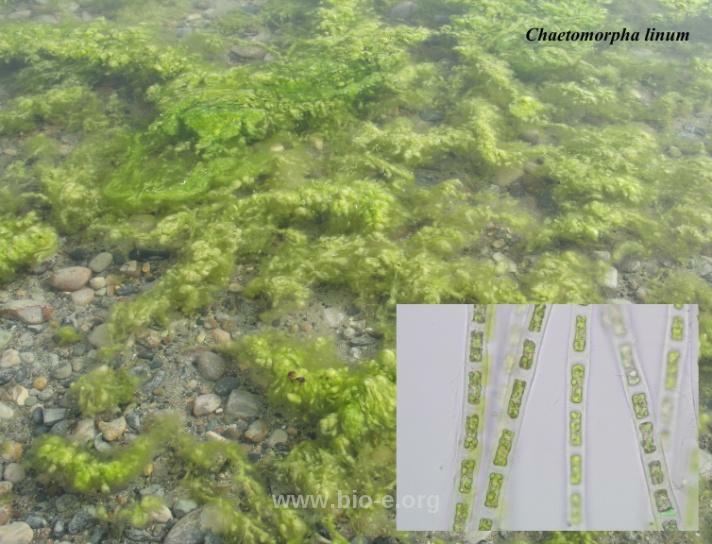 The aquatic macrophytes observed in Larnaca salt lake complex include salt-tolerant plants such as: Ruppia maritima, Althenia filiformis, Lamprothamnium papulosum, Chaetomorpha linum, Ulva intestinalis, Riella helicophylla. All species found in the area are saline-tolerant and some of them are characteristic for temporary salt habitats like Riella helicophylla and the variety of Ruppia maritima var. brevirostris. The brick red unicellular algae Dunaniella salina (Teodoresco) is located at the base of the lake food chain since it belongs to the main primary producers of the ecosystem. Along with Dunaniella salina, the filamentous algae Chaetomorpha linum, the charophyte Lamprothamnium papulosum, the pteridophyte Riella helicophylla (Manolaki et al., in press) and the angiosperms Ruppia maritima var. 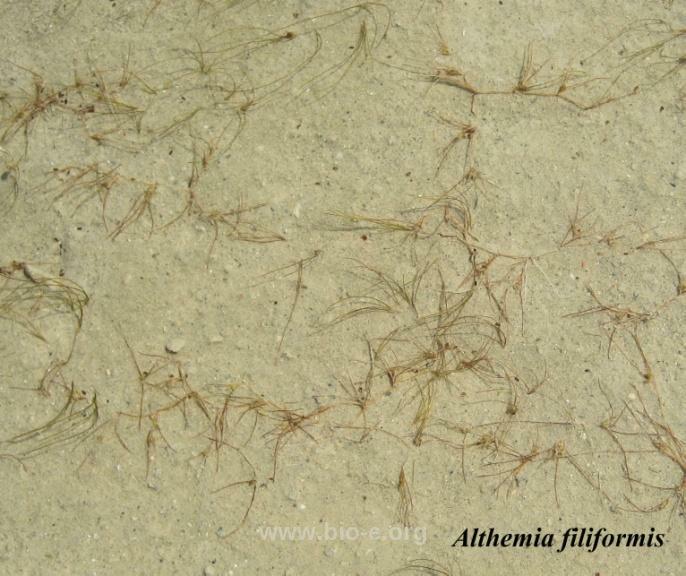 brevirostris and Althemia filiformis also support the primary productivity of the lake. The primary producers support the fairy shrimp Branchianella spinosa and the brine shrimp Artemia salina that consist the primary consumers of the food chain (Mura, 1993). 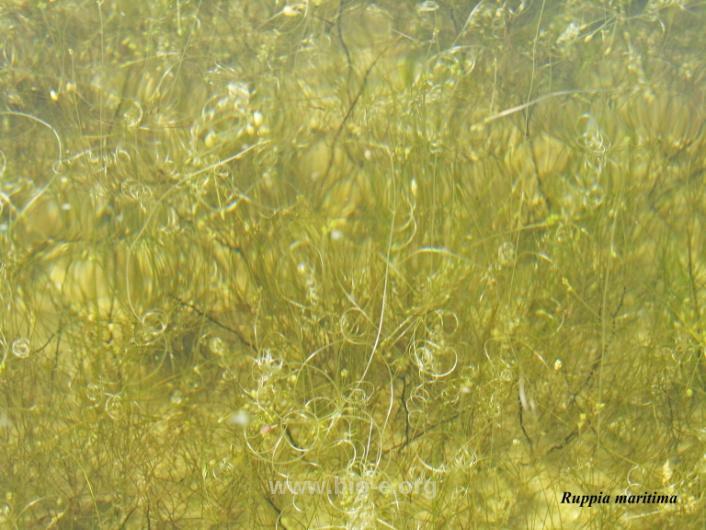 In addition, invertebrates and insects that lay their eggs in the secure microhabitat created by the aquatic macrophytes growing on the substrate and halophytes. The invertebrates and insects develop colonies that attract avifauna; the site has more than 100 bird species. Typical species include Himantopus himantopus and Charadrius alexandrinus, many migratory birdsstopover in order to feed and rest (http://www.birdlifecyprus.org). Furthermore, on average about 1000-2000 Flamingo overwinter here each year. In peak years, such as 1995 and 2005, there may be as many as 7000 (Hadjichristophorou, 2004; Demetropoulos, 2006). The secondary consumers level is consisted of some preying insects like Sphodromantis viridis and Blepharopsis mendica. These insects usually feed on other insects or any dead birds, mammals or reptiles. (Battiston et al., 2010; Battiston et al., 2008). These producers in combination with primary consumers constitute the main food of the side avifauna. Tertiary consumers level forms the top of trophic chain and it consisted of birds, residents or migrants, feeding on insects’ colonies and shrimp populations. Around Larnaca Salt Lakes, there are many extensive salt flats, mainly in the east and south of the lakes, where halophytic communities are dominating the landscape with ecologically important habitats. Many halophytes taxa such as Salicornia spp (glassworts) and Suaeda fruticosa etc are characteristic of these ecosystems which stretch down to the sea. In the small grove on the western shore of the main Salt Lake, near the historic mosque (the Tekke area), but also in other areas around the lakes, many species of orchids can be found such as Orchis italica, O. coriophora, Spiranthes spiralis, Serapias spp, as well as several Bee orchids, such as Ophrys umbilicata, O. flavomarginata, O. apifera, O. Lutea and O. fusca (Hadjichristophorou, 2008, http://www.moa.gov.cy). The work presented in this paper is part of a LIFE+ Project entitled “Strengthening the scientific foundation of water quality programs” (LIFE 08 ENV/CY/000460, partner, Frederick University, Cyprus). Barcelona Convention, 1978. Convention for the protection of the Mediterranean Sea against pollution. Signed 16 February 1976, in force 12 February 1978 (revised in Barcelona, Spain, on 10 June 1995 as the Convention for the Protection of the Marine Environment and the Coastal Region of the Mediterranean). Battiston, R. & Massa, B., 2008. The Mantids of Caucasus (Insecta Mantodea)-Atti dell’Accademia, Roveretana degli Agiati, a. 258, ser. VIII, vol. VIII, p 5-28. Battiston, R., Picciau, L., Fontana, P. & Marshall, J., 2010. Mantids of the Euro-Mediterranean Area. Birds of Greece, Cyprus and Europe, 2007. Bird Guide (Greek Version). Greek Ornithological Society, Athens, Greece. Boulton, A.J. & Brock, M.A., 1999. Australian Freshwater Ecology: Processes and Management, CRCFE, Canberra. Chaplin, S. & John, J., 1999. Algae and invertebrate assemblages in Lake Cowan and Lake Dundas, Western Australia, March, (Obsorne, J. (ed), School of Environmental Biology, Curtin University of Technology, Pert, Western Australia. 38pp. Demetropoulos, A., 2006. "Sustainability and Protection of Freshwater Ecosystems in Cyprus" Report to DFMR in the context of the CONFRESH Project. Nicosia, Cyprus. Hadjichristophorou, M., 2008. "Lead shot at Larnaca Salt Lake - Assessment and Restoration Activities". Department of Fisheries and Marine Research (DFMR), Cyprus. Hammer, U.T., 1986. Saline Lake Ecosystems of the World. Dordrecht, The Netherlands: Kluwer. Jellison, R., Zadereev, Y.S., DasSarma, P.A., Melack, J.M, Rosen, M.R., Degermendzhy, A.G., DasSarma, S. & Zambrana, G., 2004. Conservation and Management Challenges of Saline Lakes: A Review of Five Experience Briefs. Lake Basin Management Initiative. Thematic Paper. 1-28. Manolaki, P., Giannouris, E., Tsakiri, E. & Kadis, C., 2011. Riella helicophylla (Bory & Mont.) Mont. Journal of Bryology (in press). Mura, G., 1993. Seasonal Distribution of Artemia salina and Βranchinella spinosa in a Saline Astatic Pond in South West Sardinia, Italy, Vol. 64, No. 2, pp. 172-191. Ramsar Convention Secreteriat, 2007. Wise use of wetlands: A Conceptual Framework for the wise use of wetlands. Ramsar handbooks for the wise use of wetlands, 3rd. edition, vol. 1. Ramsar Convection Secreteriat. Gland, Switzerland. Shiklomanov, I.A., 1990. Global water resources. In: Nature and Resources (UNESCO), v. 26(3) p. 34-43. Smith, R., Jeffree, J., John, J. & Clayton, P. Review of methods for water quality assessment of temporary stream and lake systems. Final report, September 2004. Australian Center for Mining Environmental Research Kenmore, Australia. p.46. Smith, V.H., Tilman, G.D. & Nekola, J.C., 1999. Eutrophication: impacts of excess nutrient inputs on freshwater, marine, and terrestrial ecosystems. Environmental Pollution 100: 179–196. Tziortzis, I., 2008. Monitoring of ecological quality of coastal ecosystems in Greece and Cyprus, within the framework of the 2000/60/EC Water Directive: Kotychi-Prokopos lagoons, Larnaca-Cape salt marshes. Wharton, D.A., 2002. Life at the limits. Organisms in extreme Environments. Cambridge University Press. pp. 319. Williams, S.L. & Davis, C., 1996. Population Genetic Analyses of Transplanted Eelgrass (Zostera marina) Beds Reveal Reduced Genetic Diversity in Southern California, Restoration Ecology, Volume 4, Issue 2, pages 163–180, June 1996. Williams, W.D., 1996. The largest, highest and lowest lakes of the world: saline lakes.